The Prestonwood Flyers Swim Team has been an institution in our neighborhood since 1973. During that time, the children of Prestonwood Forest have been provided with excellent opportunities to improve their swimming skills, test themselves against others in competitive events, and to merit an opportunity to compete at higher levels. Over the years many Flyers team members have earned well-deserved college scholarships through participation in the Prestonwood Flyer Swim Team. Flyers Swim Team activity promotes strong kids, focuses on good sportsmanship, and healthy competition. Our neighborhood youth, from the ages of five to seventeen, swim on the Flyers team. Since there are tremendous opportunities with running the team, parents volunteer their time and talent in supporting the Team at a multitude of levels - creating a truly unique and memorable ‘parent and child’ activity. 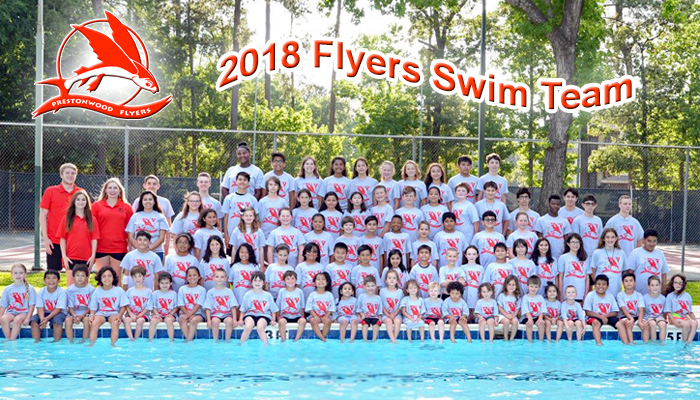 The 2018 Prestonwood Flyers team placed 3rd at the Northwest Aquatic League (NWAL) Divisionals swim meet, where 26 Flyers qualified for the NWAL All Stars Invitational Tournament. Congratulations to the entire 2018 team!